NEW YORK, N.Y., March 2 (SEND2PRESS NEWSWIRE) — CheapOair launched two additions to its site, the Top 50 Destinations and the Top 25 City Pairs pages. The lists tally travel trend data on the Top 50 Destinations and Top 25 Travel Routes most searched by customers on CheapOair.com as well as the lowest fares to those cities. Each Tuesday morning the lists are updated so it’s easy to stay in touch with current hot spots – both domestically and internationally. Changes in week over week popularity are also displayed to see which destinations are trending at all times. Florida destinations remain popular, with five of the top ten 2011 domestic flights being booked to Florida cities. Orlando has surpassed Las Vegas for most booked destination in 1Q 2011 vs 1Q 2010 along with several Florida cities moving up the list, most likely due to severe weather the country faced in January. Las Vegas and Los Angeles still remain in the top three, while San Francisco has been replaced by Denver in 10th place. More info: http://www.cheapoair.com/top-50-destinations . The January cold weather and snow storms have impacted the top 10 travel routes booked on 2011 vs 2010, with a greater number of departures being from Minneapolis, Detroit and Boston – all cities that were heavily hit during the snow storms. More info: http://www.cheapoair.com/top-25-city-pairs . For more information about CheapOair or these new pages, please visit Top 50 destinations and Top 25 city pairs or call toll free 888-516-4914. CheapOair is a top 10 online travel booking site and a leading supplier of airfares, hotels, car rentals and vacation packages. Backed by Travelong, which ranked 13th in the industry in Travel Weekly’s esteemed 2010 “Power List,” CheapOair offers the best in value with attractive solutions for today’s savvy traveler. Their portfolio of products include over 100 million airfare combinations on over 400 airlines, low airfare guarantees, 100,000 negotiated hotel rates and the technological foundation to deliver affordable tickets to every region in the world. Current domestic and international travel trends are available at Top 50 Destinations (http://www.cheapoair.com/top-50-destinations) and Top 25 City Pairs (http://www.cheapoair.com/top-25-city-pairs). For more information, call 866-636-9088 or visit www.cheapoair.com . 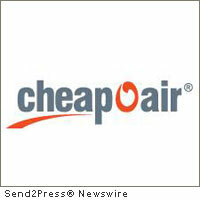 – RSS news feed for CheapOair: https://send2pressnewswire.com/author/cheapoair/feed . Original Keywords: Top 50 Destinations and the Top 25 City Pairs pages, online travel booking site, Travelong, travel trend data, top ten 2011 domestic flights CheapOair New York New York NEW YORK, N.Y.
REFERENCES: Business News, Top 50 Destinations and the Top 25 City Pairs pages, online travel booking site, Travelong, travel trend data, top ten 2011 domestic flights CheapOair New York New York NEW YORK, N.Y.